The National Cancer Institute describes a brain tumor as a mass of tissue that grows within the brain. Such tumors can either be malignant or benign. A malignant tumor contains cancer cells that may spread throughout the brain and spinal cord. A benign tumor does not contain cancer cells, often grows quite slowly, and, once removed, rarely re-grows. However, the tumor may cause serious symptoms and may even be life-threatening. Often, a first step in treating either benign or malignant tumors is surgery to remove as much of the tumor as possible. A variety of complications may occur. A significant potential unwanted effect of brain surgery is that of infection. According to the National Institutes of Health website Medline Plus, the brain itself may become infected if bacteria enter the brain during surgery. However, besides this risk, patients are at risk for the skull being infected, because to access the tumor and remove it, a small hole in the skull may have to be made. If infection does develop after brain tumor removal, antibiotic therapy is a common option to help with symptoms and decrease the risk of death. The surgical removal of a brain tumor, whether malignant or benign, also has a possible after-effect of bleeding. In medical terms, this is called an intracerebral or intracranial hemorrhage. As blood pools within the brain, the amount of pressure on the brain or within the brain can reach dangerously high levels. This situation can lead to unconsciousness or death. 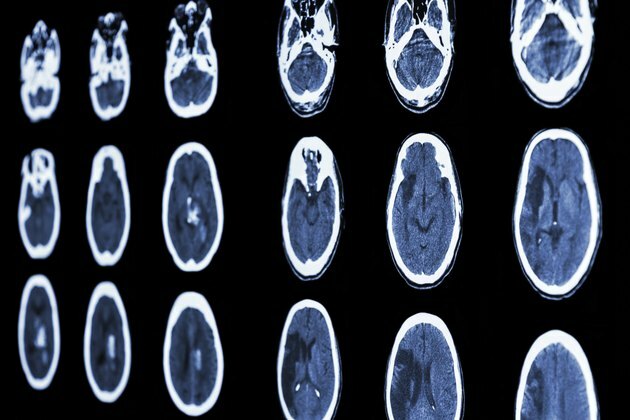 Symptoms suggesting an intracranial bleed include a headache, nausea and vomiting, and neurological changes such as increasing weakness or numbness. A seizure is an outward indicator -- seen as a change in movements or behavior of a patient -- that there is abnormal electrical activity occurring within the brain. Brain surgery -- for tumor removal or for other reasons -- may result in a patient suffering from seizures. These seizures may occur directly after the surgery or occur months or even years after the surgery has been done. This is an important distinction to make: If the seizure occurs immediately after the surgery, it would be considered a "provoked" seizure. However, if a patient continues to have seizures long after the surgery has taken place, the seizures are considered "unprovoked" and the patient may be given the diagnosis of epilepsy. The National Institute of Neurological Disorders and Stroke says that the brain of the person who had brain surgery, while healing from the surgery, made new, abnormal nerve connections. These connections then cause the patient to experience unprovoked seizures, which may occur only occasionally or multiple times a day. Often, seizures can be treated and prevented with anticonvulsant medications. In about 25 to 30 percent of cases, patients are said to have "intractable" epilepsy because it is not responding to any treatment. Another possible complication, or effect, of brain tumor removal by surgery is stroke. A stroke, according to the National Institute of Neurological Disorders and Stroke, is the medical situation when there is a sudden interruption of blood flow within the brain. This may be due to a blood vessel breaks or when the blood vessel is blocked. In either case, the area of the brain supplied by that vessel cannot get the necessary oxygen and nutrients needed, and brain cells within the area die. This may result in permanent damage to areas involved in speech, vision or movement -- for instance, a patient who has experienced a stroke may find that he is weak or even paralyzed on one side of the body. Treatment of a stroke as it is occurring focuses either on stopping the bleeding within the brain -- if the stroke occurred due to a broken blood vessel -- or dissolving the blood clot that caused the stroke -- if it occurred due to a blocked blood vessel. When the stroke has taken place, treatment focuses on prevention of subsequent strokes using medications and rehabilitation therapy to help with disabilities that may have been caused by the stroke. What Are the Treatments for Cerebellar Stroke?